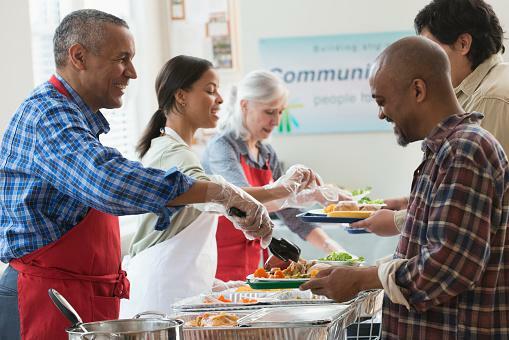 Volunteers generously give their time to make nonprofit and charity organization events or programs run smoothly. Acknowledgement of this selfless effort from time to time helps remind these individuals of their importance to the greater good. As with any employee, customer, or client, effective communication includes praise. Use these phrases as one means of showing your gratitude for the hard work and sacrifice volunteers put in with your cause. The impact of those giving of their time to important causes is immeasurable. Show your appreciation by focusing on imagery that attempts to showcase the magnitude of community service. If we had a penny for every time you helped someone, we'd never need to fundraise again. Volunteers have the most amazing superpower of all. When they touch one person, they touch them all. Some people place value on power and things. Our greatest asset is people like you. To gauge your impact, we'd need to create a new source of measurement. As a plant spreads its seeds across the land, so do you too spread compassion far beyond where you're planted. Like an earthquake, our mission emanates aftershocks thanks to your efforts. In life, there are no sure bets, except that people like you will rise to the occasion and make the world a better place. Without volunteers like you, we'd have a world full of services with no one to provide them. There are several types of quotes you can use to thank volunteers. When writing a message of thanks, plays on words and analogies are a great way to drive your point home. A quote like: "Volunteers are the life raft holding all the people when the ship begins to sink. Thanks for keeping us afloat in the hardest of times," shows volunteerism's impact. You can also opt for simple messages like, "Thank you doesn't say enough, not when you've answered our call long before it was ever made." Community service participants will feel appreciated and valued when you point out their abilities and importance. Another great option is, "If we lost all our funding today, the community could rest assured our volunteers would keep working long after the lights have been shut off. Thanks for providing the security we never could." The necessity for and appreciation of volunteers has not gone unnoticed in public forums. From celebrities to nonprofit employees and other volunteers, these quotes have universal appeal. A poem such as Dedicated Hearts by Kelly Roper shares the unique skill set of volunteers with lines like, "To care so much for your fellow man/is a quality all too rare." "Those who can, do. Those who can do more, volunteer," by an unknown author plays off another popular saying and shows the level of dedication shown by volunteers. Debbie Weir shared the sentiment, "There is no "I" in team, but we sure are glad there is "u" in volunteers!" A meme from PTO Today shares, "When you volunteer you are not paid in recognition, you are paid in love." An anonymous author explains the power of volunteers in saying, "Volunteering is the ultimate exercise in democracy...when you volunteer, you vote every day about the kind of community you want to live in." "Here's to all the volunteers, those dedicated people who believe in all work and no play," says comedian Robert Orben as thanks to those dedicated to community service. Let volunteers know their value to your population and organization. Displaying appreciative sayings around your organization and on volunteer apparel spreads the message of thanks all the time. For a more personal delivery, use these quotes on cards, personalized gifts, thank you notes, or favors at volunteer appreciation celebrations.